Eating like a Greek is not only healthy; it’s also delicious! Tough economic times and growing poverty in much of Europe are reviving a humble tradition that began some one-hundred years ago in the Italian city of Naples. It’s called caffè sospeso — «suspended coffee»: A customer pays in advance for a person who cannot afford a cup of coffee. The Neapolitan writer Luciano de Crescenzo used the tradition as the title of one of his books, Caffè sospeso: Saggezza quotidiana in piccoli sorsi («Suspended coffee: Daily wisdom in small sips»). The barista would keep a log, and when someone popped his head in the doorway of the cafe and asked, «Is there anything suspended?» the barista would nod and serve him a cup of coffee … for free. It’s an elegant way to show generosity: an act of charity in which donors and recipients never meet each other, the donor doesn’t show off and the recipient doesn’t have to show gratitude. The writer says the tradition is part of the city’s philosophy of life. «In other words, it was a cup of coffee,» de Crescenzo says, «offered to the rest of humankind.» It was a time, he adds, when there were more customers who were poor than those who were well-off. It’s fitting that the tradition started in Naples, a city that prides itself on having the best coffee in Italy. And in a country where the first coffeehouse in Europe opened in 1683 (in Venice), that is no small claim. Before the likes of Gaggia and Cimbali started producing the modern commercial espresso machines, Italians made coffee at home on the stovetop with a coffee maker known as a Napoletana. Naples and coffee are inseparable, but the caffè sospeso tradition waned as Italy entered the boom years of postwar reconstruction and La Dolce Vita. For decades, the custom was confined mainly to the Christmas season. The practice is now spreading to other crisis-ravaged parts of Europe. In Bulgaria, the European Union’s poorest country, where several desperate people have set themselves on fire in recent months, more than 150 cafes have joined an initiative modeled on the Neapolitan «suspended coffee» tradition. In crisis-wracked Spain, a young man from Barcelona, Gonzalo Sapina, in a few short weeks started a network called Cafes Pendientes («pending coffees») and promoted the initiative among numerous coffee shops. In France, several cafes now carry the logo «cafe en attente» («waiting coffee»). And there is even a site that lists establishments that have joined the «suspended coffee» initiative — the countries range from the U.K. and Ireland and Hungary to Australia and Canada. The prepaid cup of coffee has become a symbol of grass-roots social solidarity at a time of mounting poverty in what, until recently, were affluent Western societies. But now, back to Naples, where coffee is not a luxury but is considered, more or less, a basic human right. And the variety is vast: You can order an espresso «ristretto» («tightened,» i.e., stronger); or an espresso «macchiato» («stained,» i.e., with a little milk); or an espresso «corretto» («corrected,» i.e., with a shot of grappa, cognac or sambuca). There’s only one iron-clad rule: Cappuccino — which takes its name from the white and beige colors of the Capuchin friars’ habits — is exclusively a breakfast beverage, and must never, never be consumed after 11 a.m. (OK, let’s say noon). Insight – Whatever happened to France’s voice in Europe? – a state of slime and a loud chorus of chirping. Ta Yp’Opsin (Consider These) weekly podcast (in Greek) with Chicago journalists Elena Spilioti and George Zorbas. Discussion, analysis and great music! 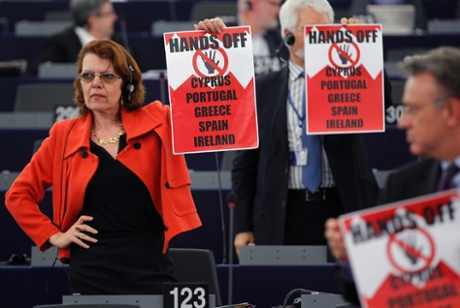 Members of the European United Left of the European Parliament group held up posters with the slogan «Hands off Cyprus, Portugal, Greece, Spain, Ireland». The European Parliament has released details of its concerns over the Cyprus bailout, following this morning’s grilling of commissioner Olli Rehn. It confirms that MEPs were scathing about the Eurogroup’s handing of the issue, and also condemned the decision (later reversed) to impose losses on smaller savers. Criticism rained down on Rehn from all sides of the spectrum, with accusations of double standards and claims that Germany displayed ‘near colonial’ behavior. – a comprehensive U.S. immigration bill? – jail can be a nice place for overnight stays! This year’s batch of springtime pranks includes the usual onslaught from Google, along with notable entrants from Nokia, Sony, and others. Without further ado, here are some of the highlights. • With Google on April Fools’ Day, where does one begin? Perhaps, as is advisable whenever a possible prank appears, with a smell test — and that would be a dead giveaway when it comes to Google Nose, all 15M+ scentibytes of it. And what’s this? No more YouTube? Well, if you believed that one, Google’s got a pirate treasure map for you. Plus: Emoticons for your photos and home renovations a la Street View. • Google also got in a playful jab at Microsoft and Windows Blue with its Gmail Blue spoof while Microsoft returned the favor with a Bing zinger. for the iDevice of your choosing, no matter how large.